Oculus VR touts a wide range of genres, price points, and degrees of barfiness. Early adopters of the Oculus Rift will have a healthy variety of games to choose from when the VR headset launches on March 28. Game makers aren’t clumping around any particular genre, either. Among the first wave of Oculus games is the solitary space adventure Adr1ft, a virtual reality version of Pinball FX2, racing games like Project CARS and Radial G, full-blown RPGs such as Chronos, and the intense party game Keep Talking and Nobody Explodes. Price ranges for the first Oculus games span from as little as $5 to as much as $60. Those games will also run the gamut in terms of potential for motion sickness. As VentureBeat notes, Oculus recently handed out some documentation during a press event, assigning one of three “Comfort” levels to each launch game. Most games earned the designation “Comfortable,” but some adventure games such as mountain-climbing simulator The Climb came in at “Moderate.” Games with lots of fast motion, such as Elite: Dangerous, earned an “Intense” rating. VentureBeat felt these ratings were accurate in testing, though it’s unclear for now whether Oculus will advertise them to buyers. To browse and buy these games, Oculus is opening up a store within the VR space, called Oculus Home. It’s similar to the store that already exists on Samsung’s Gear VR headset. 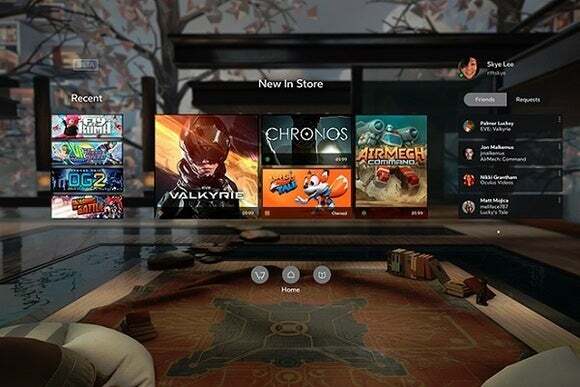 Oculus will also launch a desktop app for those who’d rather do their shopping in the real world. Why this matters: In some ways, the launch list looks a lot like any next-generation gaming platform, with a mix of all-new games that show off the system’s full potential and older titles repurposed for the latest hardware. But with VR, there’s even more pressure to prove that this is an entirely new kind of entertainment, and the real test will come in the months after launch when more developers get on board.